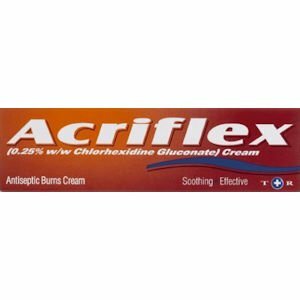 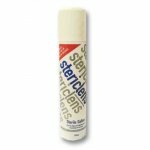 Acriflex antiseptic burns cream is for the treatment of minor burns and scalds, scratches, cuts and abrasions, sunburn blisters and infected, cracked skin. 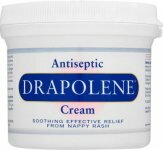 For general use, apply freely and smooth gently into the skin, for cuts, abrasions, burns etc, spread freely and if necessary, cover with a dressing. 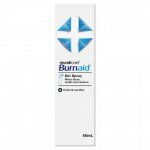 Chlorhexidine Gluconate Solution Equivalent to Chlorhexidine Gluconate 0.25% w/w. 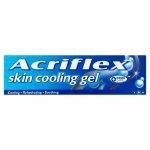 Also contains Arlatone 983 S, Cetostearyl Alcohol, Liquid Paraffin, Dimeticone 20, Glycerol, Quinoline Yellow Lake 250, Purified Water.